A jogger running through a field in the central Netherlands got a surprise on Sunday when an abandoned lion appeared on the route. 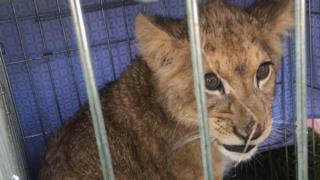 The cub - which is believed to be four months old - was found in a small cage outside Utrecht. It was taken to the Lion Foundation in the northern Netherlands after being examined by a vet, according to public broadcaster NOS. Local police have made a public appeal for information on its owner. It was certainly not business as usual for a force on patrol in Tienhoven, a village about 10km (6 miles) to Utrecht's north. On Twitter, they wrote: "This morning, colleagues received a very peculiar report in Tienhoven. Seen or heard anything?" Vet Peter Klaver told RTL Nieuws that he was shocked when he arrived at the scene. "I have travelled all over the world to stun animals, even lions and tigers, but I've never experienced anything like this," he said. He found the cage was not very sturdy and said the cub could have escaped. "But in the end it was possible to put the lion, the cage and everything into the car, so it wasn't necessary to stun it." Police said they wanted to hear from "anybody who had recently bought a lion" or anyone who could help with information about this particular cub.